Gravity orienting can be the best solution for feeding simple rolling or sliding parts. Slanted elevator chain cleats lift and discharge parts onto static orienting tooling. 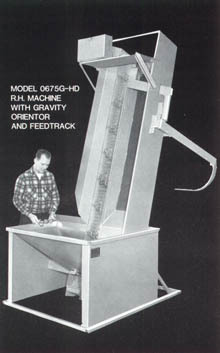 Gravity action moves them through the tooling maze where only properly oriented parts pass to discharge. Misoriented and surplus production parts return to the bin for another try at orientation. Suitable part condition and shapes can be auto fed at least cost in a gravity orienting floorbin elevator. Select from Spectrum's line of duty rated models of one to fifty cubic feet storage capacity to feed up to sixty pound parts. See Spectrum Form #13083 for duty rating specifications. All feeders are furnished with top mounted elevator drives, having standard commercially available components. Choices are available to suit power, production and flexibility needs.